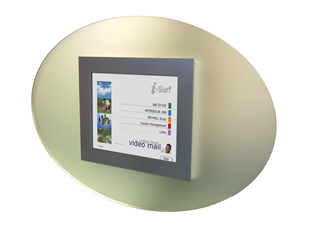 i-Touch V17 Glass Wall Mounted Kiosk with 15'' screen - Future Generation Kiosk Products. This attractive Wall Mounted Kiosk, compact in design includes a fully integrated open architecture PC. Although unusually shaped this Kiosk is constructed using non-proprietary components, making maintenance no different to a standard PC. The v17 is a stylish, minimalist glass model. Designed to be non intrusive this unit, pictured on the left, has the class and style to fit into both classic and modern styled locations, fitting in beautifully with the surrounding decor. Dimensions: 950x650x120 (WxHxD). Weight: 11kg. Please note that width and height are variable dependent on your requirements.